CES Asia is a full-on experience. The show floor is spread between five fiercely air-conditioned halls the size of aircraft hangars, while expert keynote speeches and roundtables take up the entire upper level of the adjacent Kerry Hotel. The atmosphere is electric in both senses, but some guests don't seem to care. They've trekked to Shanghai - sometimes thousands of miles - to see how the latest virtual reality (VR) tech can transport them somewhere else again. It seems a shame, but according to Steve Koenig, VP of research at the Consumer Technology Association (CTA), immersing ourselves in VR will soon be a valid lifestyle choice. "It really comes down to one single word: presence," he says in a round-table talk on future tech trends. "When you talk about virtual reality, that sense of presence can be game-changing, not just for actual gaming, but also for education and medicine." Koenig believes we're at a tipping point regarding mainstream acceptance of VR and augmented reality (AR), and draws parallels between emerging technology and the virtual world presented in sci-fi film Ready Player One. "The question of what is reality is an open one, and one that all of us will have to answer for ourselves," he says. "There'll be some people who want AR all the time - you'll see them with some kind of appliance." He holds a hand over one eye like a monocle. "Am I talking about some future like Ready Player One? Maybe, because these presences are getting very, very good. In some ways Ready Player One - the book is much better than the movie - is prescient. "I think it's totally expected that some people will decide the virtual world is better than the real one. I don’t think that's too far fetched. Is it that much of stretch? In Japan, they already have VR theme parks. These places already exist in 2018." HTC, the company behind the Vive VR headset, was an official partner for Ready Player One. According to Alvin Wang Graylin, China Regional President of VR at HTC, the film helped people understand what the technology actually was - and made them want a virtual presence of their own. "In 2016 we saw the first HTC Vive and the first Oculus Rift, then in 2017 there was a cool down from an investment perspective, and a hype and media perspective," he says. "I think that's a very heathy thing. We're now at the beginning of a new cycle, things are starting to heat up again. 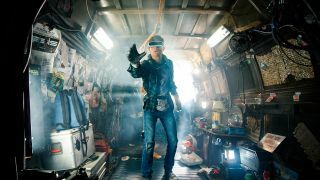 Ready Player One by Spielberg got people interested in VR again. Hundreds of millions of people now know what VR is about." For HTC, the film wasn't just entertainment, it was a calculated move to nudge the tech into public view. "The biggest roadblock in the past was that people didn’t know what it was," Graylin says. "This was a two-hour movie that educated people about the technology. "What's happened this year is the development of a standalone device with no wires. You take a device like this, put it on, click it, walk around in a whole new world and that's the frictionless nature of these devices. I think that will take VR accessibility to a new level. Mass awareness and less friction." Raising awareness is fine, but Ready Player One's 'real world' is a bleak dystopia. It's a strange ideal for anyone to aim for, even if they do build the headsets that let people transport themselves. The only places where virtual reality isn't a form of escapism from a grim and grubby existence are the menacing 'loyalty centers' where gamers must work off their debt in VR or find themselves on the wrong end of a taser. That's why traveling to events like CES Asia make sense. Making a real journey for a virtual experience might sound counter-intuitive at first, but turning VR into a physical event transforms it into something communal - like a trip to the cinema, a theme park, a games arcade or, indeed, a trade show. There are even VR 'locked room' experiences, where teams of friends don headsets together and work to solve clues against the clock. This is a particularly interesting example, because the team's efforts are also streamed online so anyone in the world can watch them attempting to unravel the mystery. The idea of 'presence' is important, but it's always within a real world context. What's more fun - taking off the visor to see your own bedroom wall, or a group of friends? Hopefully that's where the similarity with Spielberg's film ends. Rather than replacing reality, VR entertainment will only augment it.